Have you thought about the development of voice in your writing? Have you seen, or fallen in love with, other writers’ voices? In this month’s writing newsletter we explore voice and its effect on writing and the reader. Take a look! An excellent post, Teresa. 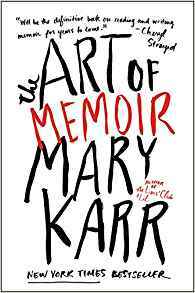 Yes, memoir gets a lot of attention, I noticed that. For me, I’m writing to pass on my legacy, so I’ll have my daughter and granddaughter and their kids in mind when I write. Thank you for sharing. I think I’ll get Karr’s book. In the coming Writers’ Conference, I’ll attend the 3-day series workshop on memoir writing. It’s coming up in a week. Hi Dahlia, I loved reading your message. I wanted to take a moment to think more about voice, and your message has been on my mind for the past week. You ask the BEST questions, I’m so honored you are part of my community. I talked to a couple of writer-friends about the question of voice. We think that it’s something that is hard to “craft,” that you can read other voices and analyze them, like the Hemingway or writers like F. Scott Fitzgerald, Edith Wharton, etc., but analyzing and doing are different things, eh? So, what came out of the conversation with my writing colleagues and me is that voice is something that develops through one’s writing, and that it can take some time to “find” or craft one’s voice. I have one friend who is a photographer, and he said he thought it was like what he does with photography, in that at first he took lots of pictures, and while they were fine, over time he started to notice things in his photos that he liked more, and that were more “his own style” than other things. For him, it was the small sights, the macro-compositions, things that looked even slightly abstract in his photograph, but that other people might not see. I think writing voice is like that, too, noticing that you are noticing certain things that other people don’t necessarily see as they walk by or as they are writing. When I think of your writing, for instance, I just love the way you view trees, that you make them come to life, they talk to you, that you notice what they look like in bloom and after blooming, how they react to the weather, what they seem to be reaching for, etc. Also your walls and old buildings, think of it, these are all inanimate objects yet you give them voices and personality! With wit and humor! If you ever wanted to, I can imagine a lovely set of stories that features the hidden life of trees, walls, old buildings, or historic monuments, and I could even see a young woman who (unbeknownst to everyone else) knows these things are intelligent and somehow talks with them or has an adventure in their world. I know how much advocacy you do for women who are imprisoned by their marriage circumstances, I wonder what might happen (just dreaming here) if a young woman imprisoned by marriage found out her tree could help her somehow escape psychologically and physically … hah! But back to voice, it’s something that “how to write” books don’t have a lot to say about, but the more you write, the more you discover what’s unique about your thoughts and writing that other people don’t have. What are your thoughts? I am deeply touched and humbled by your warm support and encouragement. I especially appreciate the freedom (and inspiration) that you give your reader to think and express nebulous thoughts and ideas. Your photographer friend’s views were an eye-opener and makes a lot of sense (especially when you link to my fledgling floundering efforts) please do convey my thanks to him but mostly to yourself for making the effort to put things into perspective for me. Asking questions is easy – giving answers that too the BEST not so 🙂 Thank you Theresa for too too many reasons to list! your time, I would like to narrate a little incident from my son’s school days. He was about 12 or 13 and being interviewed for the position of Head Boy of his school’s Primary Section. He was asked to list his qualities that made him suitable/or the best for this position. His answer was “I should not tell you that, others should tell you that.” Despite being repeatedly asked and even coaxed, he refused to budge from his stance. Needless to say he did not get the position and in fact I was called for a discussion on action plan for improving his confidence levels. When I told them I not only agreed with him but was proud of his reply, they looked at me as if I was from some other planet. As for confidence, unlike them I thought he had too much for such a little boy and bordered on arrogance! Well, Dahlia, I love your thoughtful approach to voice and to one’s own accomplishments. How lovely! To have one’s own best qualities speak for themselves. So lovely. A wealth of information here, Theresa. And I find them interesting, too. I love the little books. It’s great that you are sent It them out. All the very best! I love this thoughtful presentation of voice as well as hearing about your accomplishments. I can’t remember if I told you about the prose chapbook work shop I took at AWP. It’s a trend IMO. Congrats, Theresa! Yes, I remember that! The workshop was focused on the notion that there ARE chapbook publishers interested in prose (specifically nonfiction, in this case). Most people assume they are all for poetry, but that is changing. I have something to share with you, if you want to email me. The WS also looked at the WHY of publishing a chapbook instead of waiting until you have a full-length book. Mainly, that goes without saying. It’s a way to test out your material, get a publication under your belt, get the collected material in the hands of the reader, etc. Wonderful! I have a small list of prose chapbook publishers that I made from listings in Poets & Writers (on their website for subscribers), I think it was after you told me about the existence of the chapbook form. Good to hear it’s a way to test out your work, a great way to look at it. In my search of the P&W database last year, it was true that about 2/3-3/4 of the chapbook listings were for poetry, but the remaining 1/3-1/4 were looking for prose. Thanks for your offer to send me something – I’ll send you a note through your website!